Violence as Colombia's Indigenous Nasa oppose police and paramilitaries in struggle for "liberation of Mother Earth"
Clashes have erupted in Colombia’s western department of Cauca as the Nasa Indigenous Peoples press the government to fulfill its promise to return 15,600 hectares to their control. 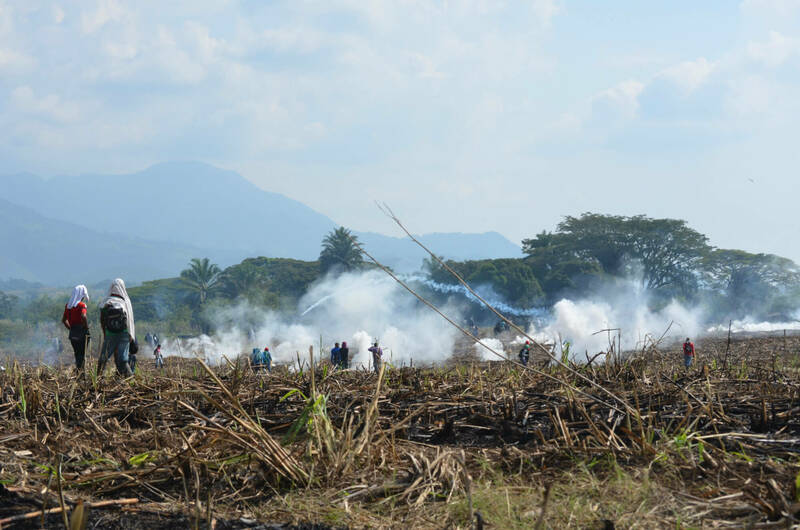 A succession of occupations of sugar plantations has seen the government deploy the army and riot police against them prompting fierce battles across the north of the region. 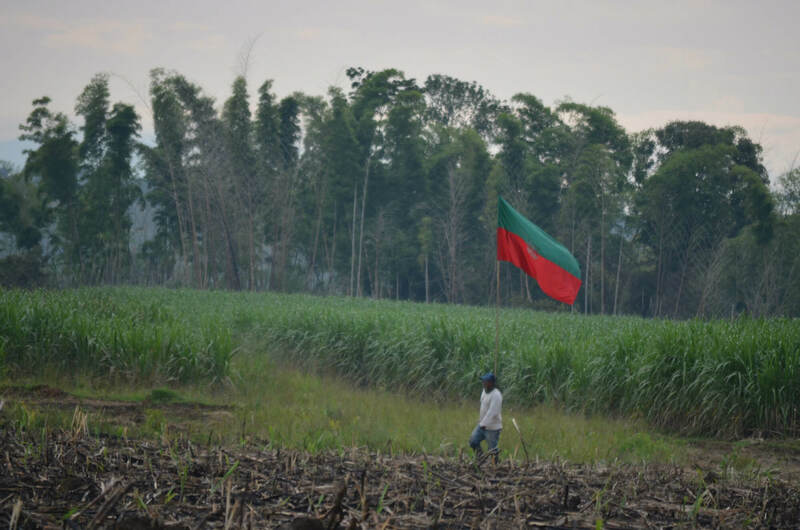 This is the latest stage in a decades-long struggle for the return of indigenous territory lost to intensive agriculture, a struggle that received international attention in past decades following a wave of massacres. 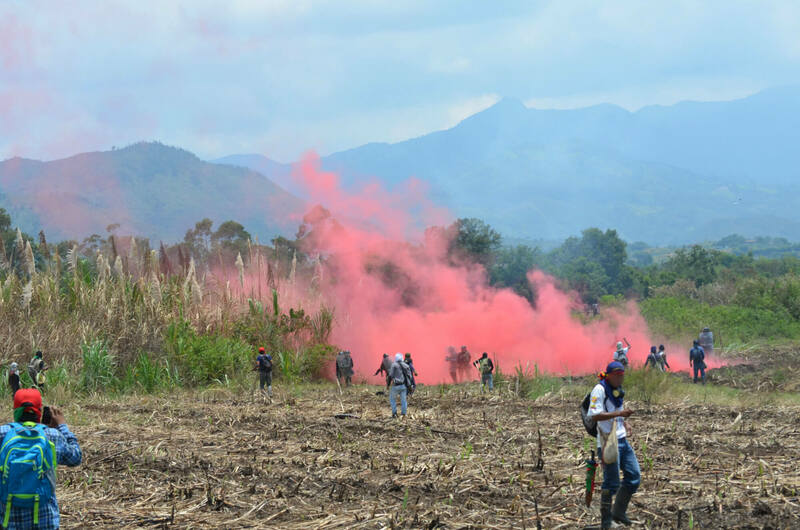 Protected by the Indigenous Guards, the fields remain largely under Nasa control, but an abrupt rise in threats from the “Black Eagles” paramilitary group and the issuance of new eviction orders by the government raise fears that deadly violence may return to the region. There was no shade to shelter the small party as they crossed the expanse of earth last week, carrying a plantain sapling and a bag of maize. 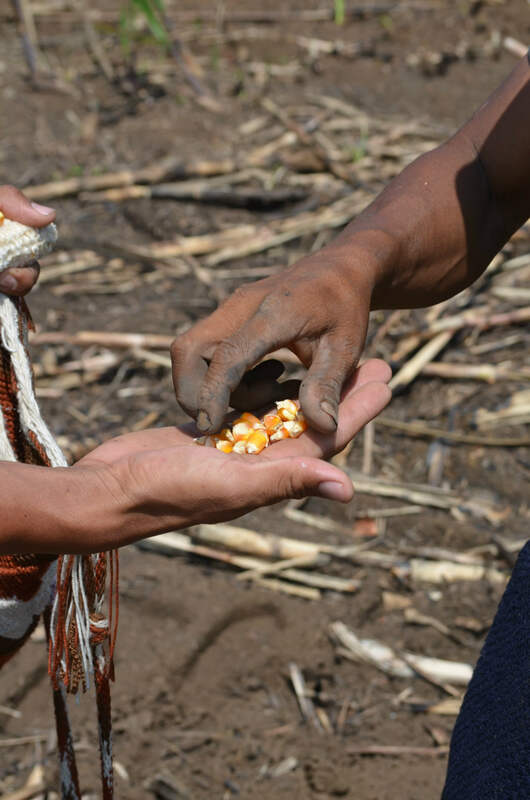 In the middle of the field, its vastness already rippling in the morning heat, they planted the sapling and scattered the seeds of local indigenous maize. Keeping an eye on the ‘ESMAD’ riot police stationed in the shade of the trees around the hacienda was a local teacher. “We are recuperating the land” she told IC. “We are replacing the mono-cultivation of the multinationals with the original vegetation. …One day trees will be growing here again: what we are seeing is the liberation of Mother Earth”. The Indigenous Nasa peoples have been seeking the ‘liberation’ of the territory of the hacienda for years, regularly occupying the fields and buildings, and blocking the road that runs between the property and the Nasa reservation of Huellas. 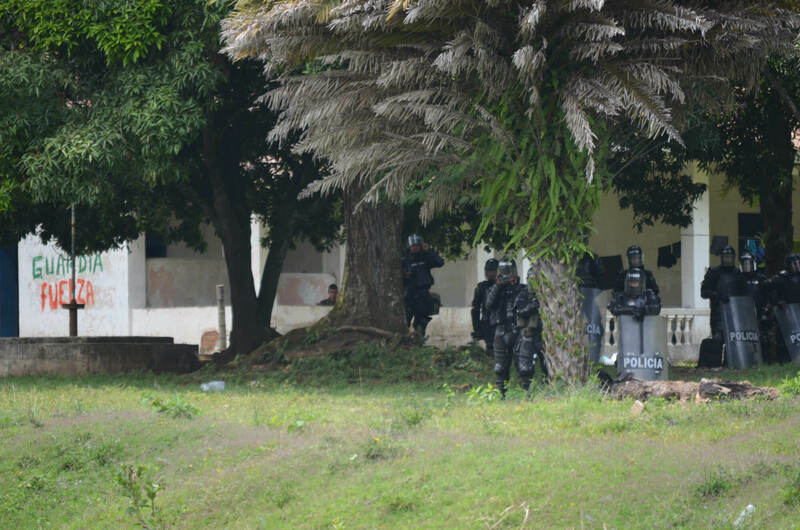 Behind the line of riot police, soldiers patrolled the buildings of the ‘Hacienda La Emperatriz’. Two weeks ago, on Mar. 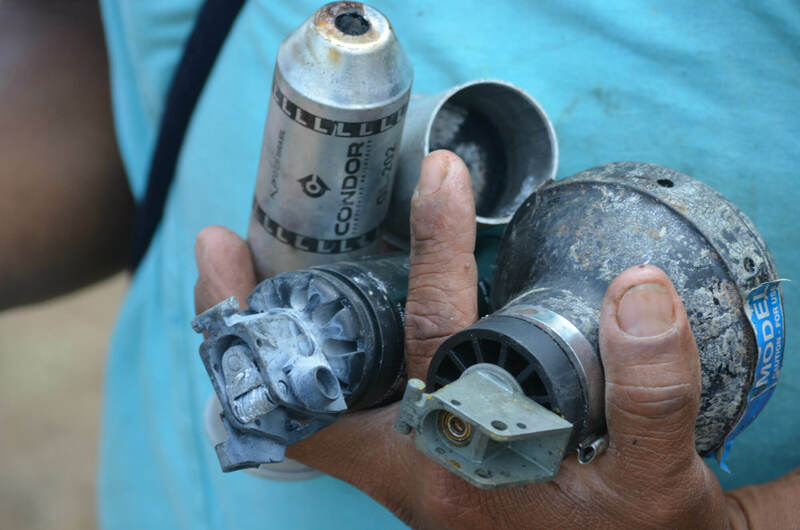 17, they had opened fire on the Nasa, citing a leaflet supposedly delivered by the FARC guerrillas claiming to have infiltrated the indigenous demonstrators. Three Nasa were injured by gunfire. 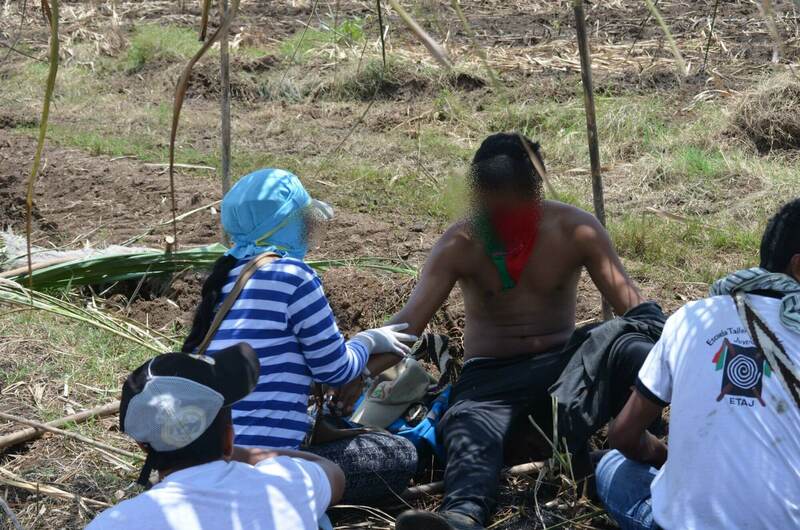 The planters continued sowing the seeds in the growing heat, small handfuls as a symbolic gesture amidst the stumps of sugarcane and the cast tear gas grenades of earlier confrontations. 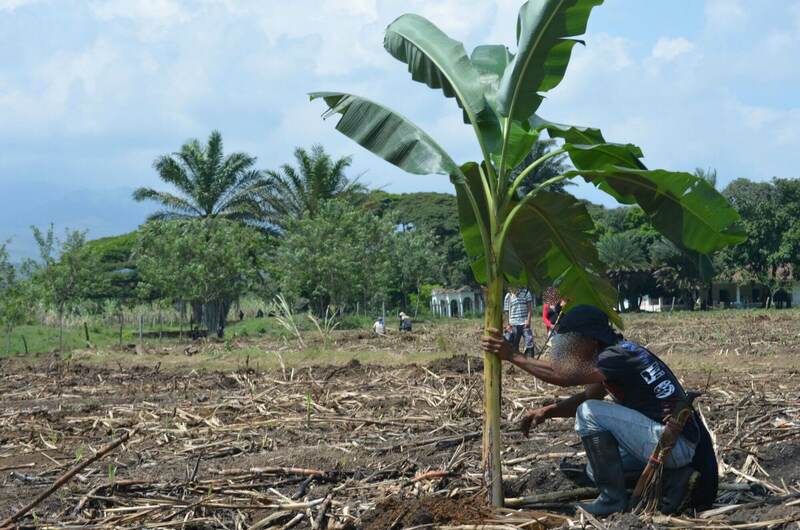 In the distance other groups worked with maize and plantains, often among patches of ground where the sweet fermented smell of burned cane indicated where the plantations had burned during confrontations with the ESMAD. Finally the calm was broken as the riot police drove an armoured vehicle down the road parallel with the fields, a line of police advancing across the cleared plantations to keep pace with it and firing gas and stun grenades at the Nasa. 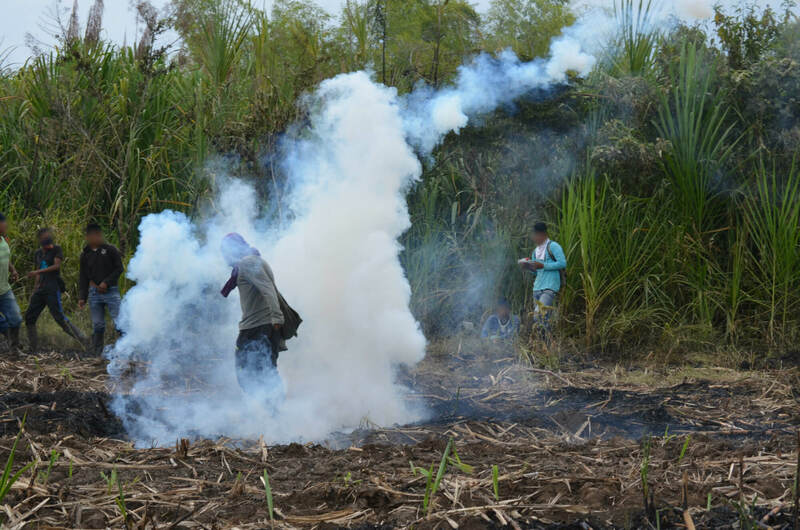 The indigenous responded with catapults and slingshots, and the police line was halted halfway across the sugar fields from where they fired stun grenades and gas grenades coated with marbles. 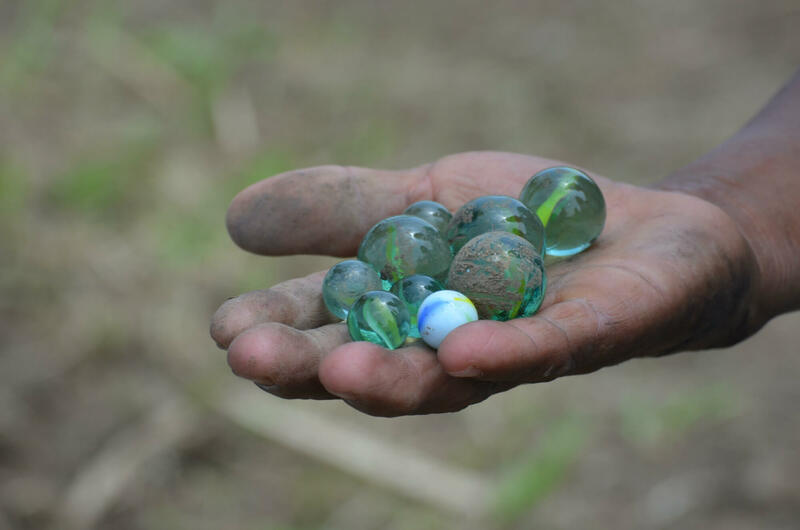 These were lobbed high in the air; their explosion shooting the marbles out like bullets. 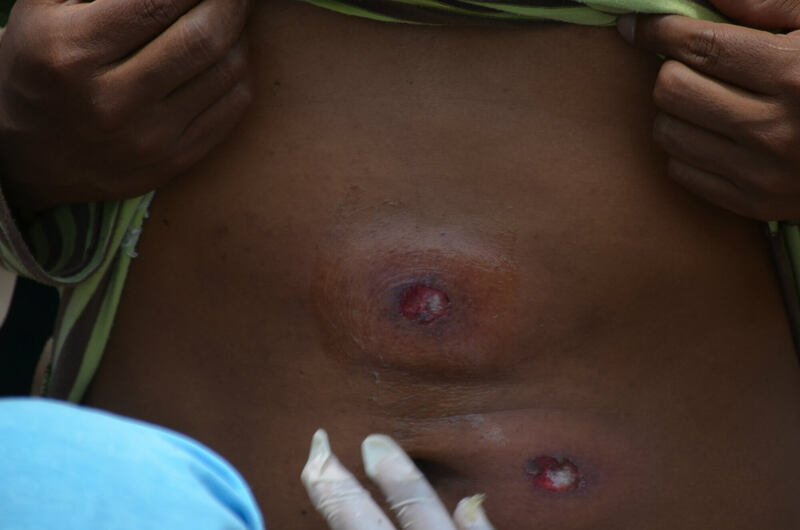 Other gas and stun grenades were regularly fired parallel with the ground, directly at the bodies of the Indigenous, causing a steady stream of injuries to be treated by the community’s medical teams. 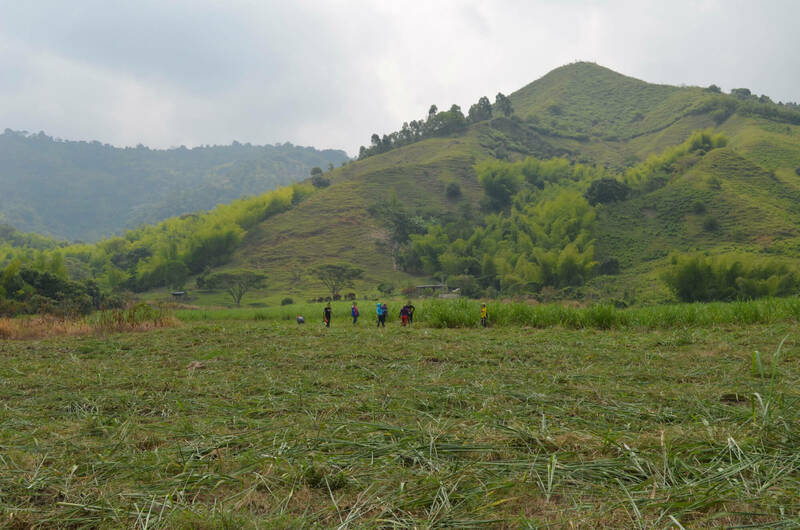 Fierce battles regularly erupted where a stream surrounded with bamboo offered cover for each side to attempt to outflank the other. The Nasa used a three-man catapult against the ESMAD, often forcing them back, while the riot police hidden on the other side of the stream responded with missiles fired blindly at the three. A hostile stalemate over the plantation lasted for the rest of the day, the gas clouds blown sometimes one way, sometimes the other. The plains of Colombia’s western Valle del Cauca department are now an expanse of sugar; road trains of coupled trucks haul the cane from the plantations to be refined or used in the creation of ethanol. 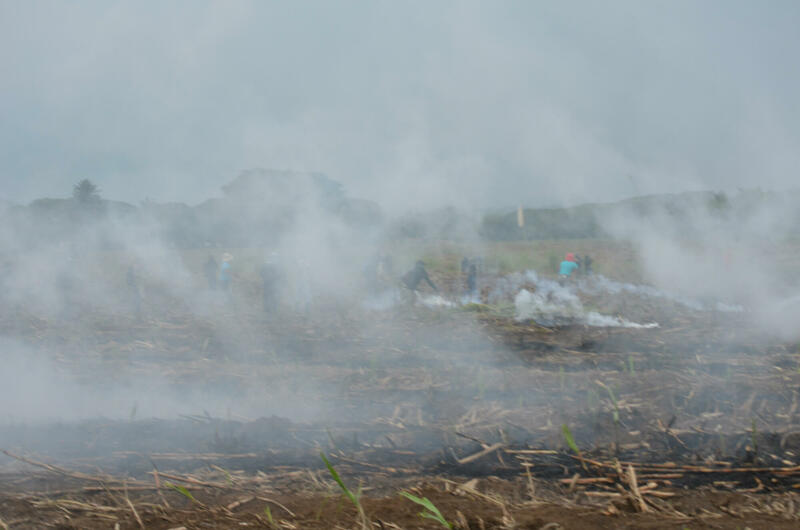 Across the plantation of La Emperatriz lie proofs of hours worked and records of fumigation tossed onto the ground in past months by contractors of InCauca, the agro-industrial multinational that runs the largest sugar refinery in Colombia and which dominates the region. A mixed landscape has been reborn in the land on the other side of the road. 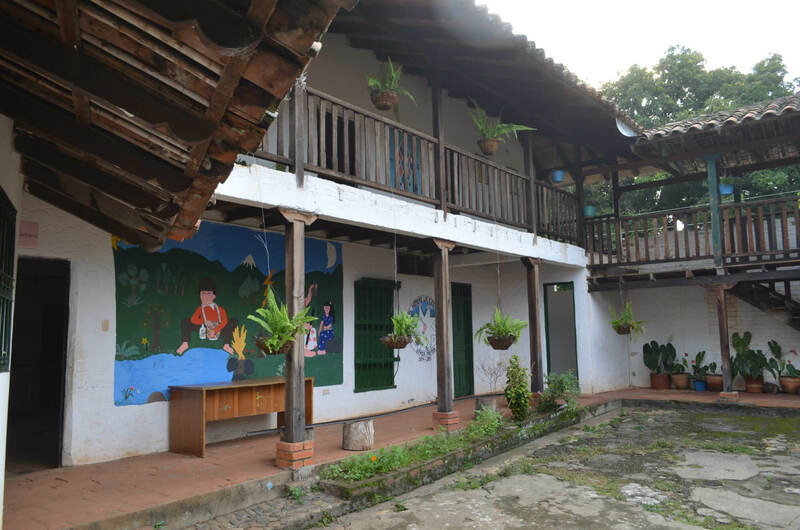 A hacienda similar to La Emperatriz has been meticulously maintained–and now, painted with Nasa symbols and iconography, serves as the community health centre and music school. The surrounding land is held in common though dotted with parcels of land where individual families farm their own mixed crops, interspersed with forest and pasture. The territory of the Huellas reservation was a cattle ranch until the Nasa retook it; the road that forms the boundary between the reservation and La Emperatriz running along the edge of the plain and below the gentle foothills of the Sierra Occidental. ACIN became a driving force in the indigenous movement of Colombia, and as part of the Regional Indigenous Council of Cauca (CRIC) its successes in overcoming state and paramilitary violence to reclaim ancestral land and oppose the export economy of intensive agriculture have gained it support beyond indigenous Colombia. In 1985, the national government was pressured into passing Decree 865, which led to the establishment of the Commission of Land for the People of Cauca, but the government machinery proceeded at a snail’s pace in realising promises of land reform. 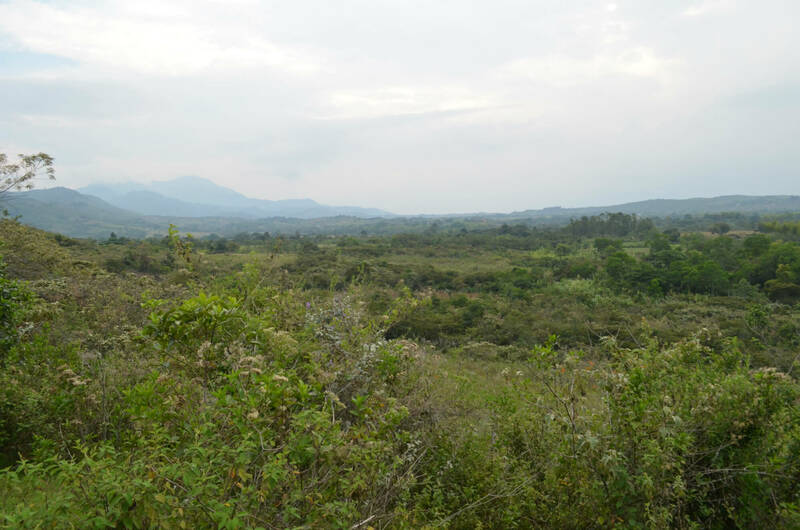 In October 1991, with threats and attacks rising against Nasa occupying haciendas, the CRIC and indigenous councils of northern Cauca asked that the Government intervene to prevent a massacre and pass 15,663 hectares to the indigenous community to settle claims. The government did not respond. On 16 December 1991, 50 armed men in military style uniforms shot 21 Nasa to death in the El Nilo hacienda. 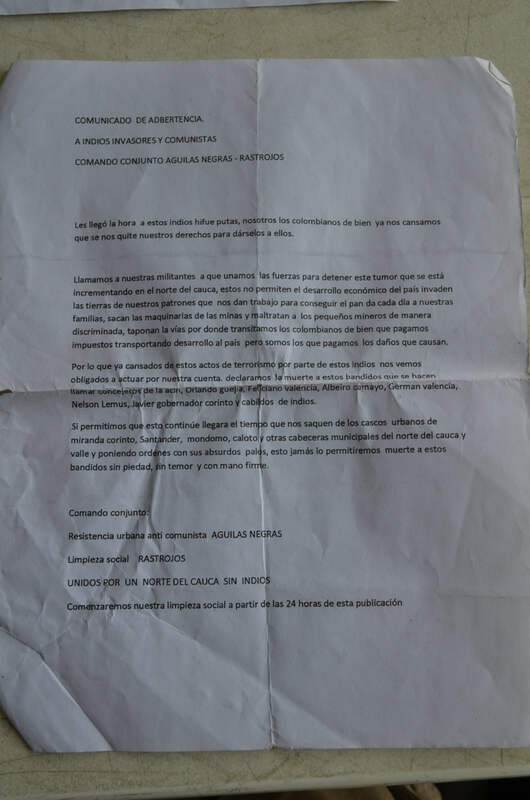 An investigation pointed to the involvement of Major Jorge Enrique Durán Argüelles, police commander of the Second District of Santander de Quilichao, and Captain Fabio Alejandro Castañeda Mateus, commander of the anti-narcotics company of that unit, along with numerous police personnel, but the charges were dropped. The Inter-American Commission on Human Rights investigated the El Nilo massacre from 1993 to 1997, publishing its recommendations in 2001 urging Colombia to investigate and prosecute those responsible for the massacre, including police officers; to make social and integral reparation to the Nasa people; and to guarantee the non-repetititon of similar acts. The government had belatedly signed an accord in Bogotá on 23 December 1991 that promised to return the requested land to the Nasa, but only a portion of this has been legally transferred. In 2001 further massacres occurred at Gualanday, San Pedro, and Maya. The government has never accepted responsibility for the massacres, and the return of properties has consistently relied on pressure from the Nasa. “We lost many people killed in order to reclaim this finca” said the ex-governor of Nasa. We had walked into the foothills to see the transformation of Huellas in the years since it had been passed to indigenous control. Between the land returned to woodland, fields of mixed crops of beans, yuca, plantain, coffee and maize were interspersed with citrus groves and pasture. The plain spread out beneath us, the endless sugar sugar plantations extending to Cali and beyond; the explosions of gas grenades and white smoke rising beyond the furthest trees of Huellas showed where the daily struggle to reclaim the plains continued. The current governor emphasized in assemblies each morning that the focus of the struggle was to recuperate the land and to liberate Mother Earth. 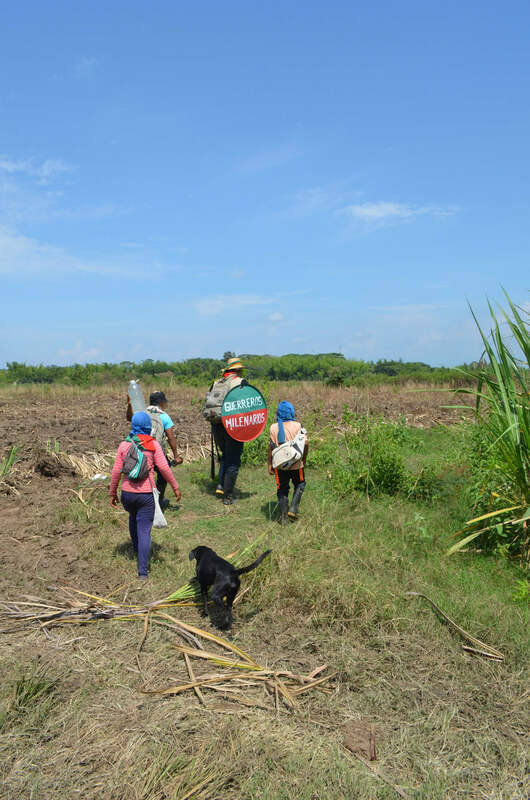 “We are Indigenous, we know how to care for the land,” she told the community, before its members prepared to return to the struggle at La Emperatriz. “Focus on your replanting of the land, don’t provoke the fighting.” The Nasa would then line up to have their heads bathed in a herbal mixture prepared by the spiritual guide. Then, they would cross from Huellas into La Emperatriz. The struggle for control of the fields is currently swinging in favour of the Nasa; the increased repression serving only to boost the numbers of those coming to the property. 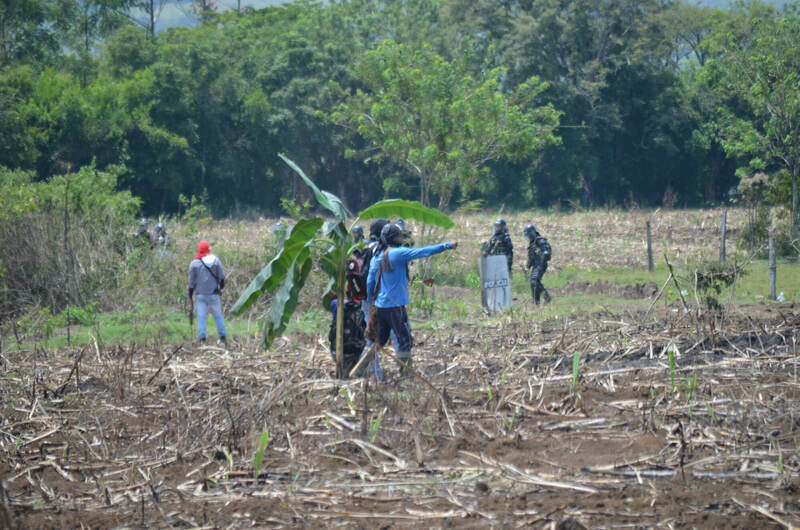 The riot police are growing reluctant to spend each day before the slings and catapults in the fields; but at the same time, as they begin to remain closer to the confines of the buildings of the hacienda the number of threats has multiplied. By night the fields are deserted by the Nasa; “In the dark the police would shoot us dead” they say, “The ‘Black Eagles’ is just the name they use at night”. 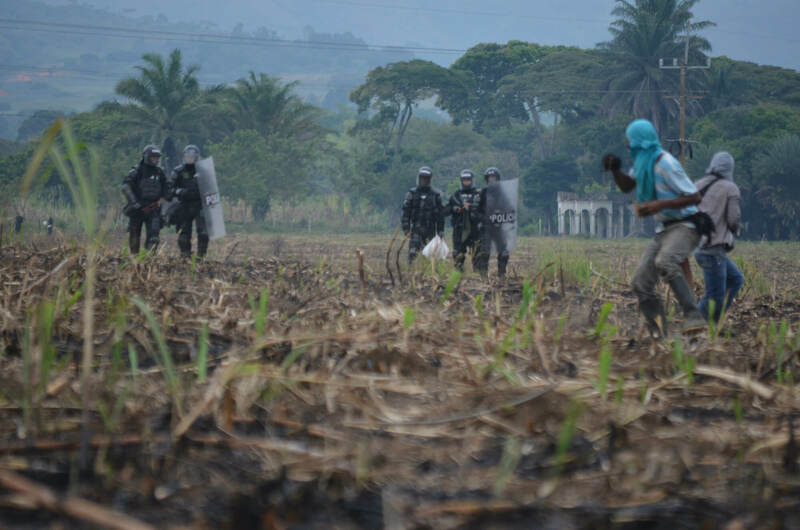 A similar pattern of disengagement followed by threats has occurred in the properties between the sugar-producing town of Corinto and neighbouring Nasa communities, where ESMAD police wielded machetes and fired live bullets injuring four Nasa who were contesting the ownership of the sugar plantations of Quebrada Seca and Garcia. 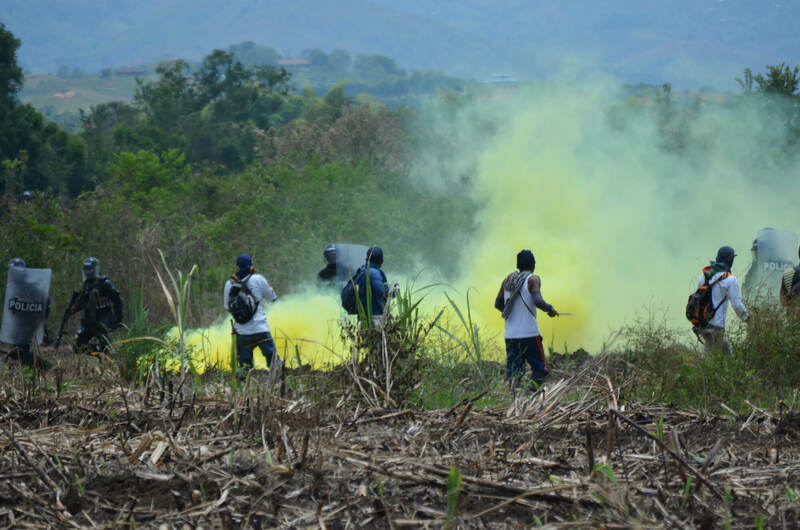 The escalation of violence prompted the UN to negotiate an agreement in which the police and army occupied the hacienda buildings of the contested haciendas of Miraflores, Quebrada Seca, Granadillo, and Garcia, while the Nasa are left in possession of the fields. The first two properties are owned outright by InCauca, the sugar company that rents the other two properties as well as La Emperatriz. Nasa have also received firearms injuries from the private security company of InCauca. 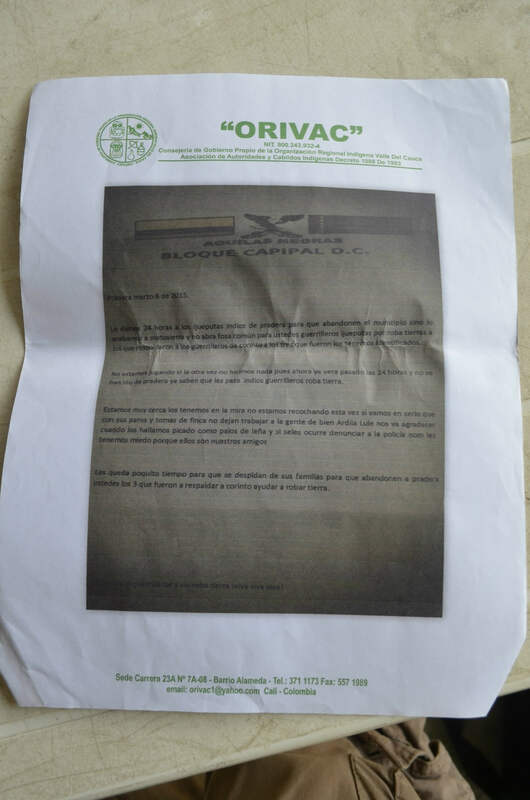 A leaflet from the Black Eagles circulated in Corinto last week, promising the “social cleansing” of the area and the eradication of the “bandits” in the sugarcane plantations. 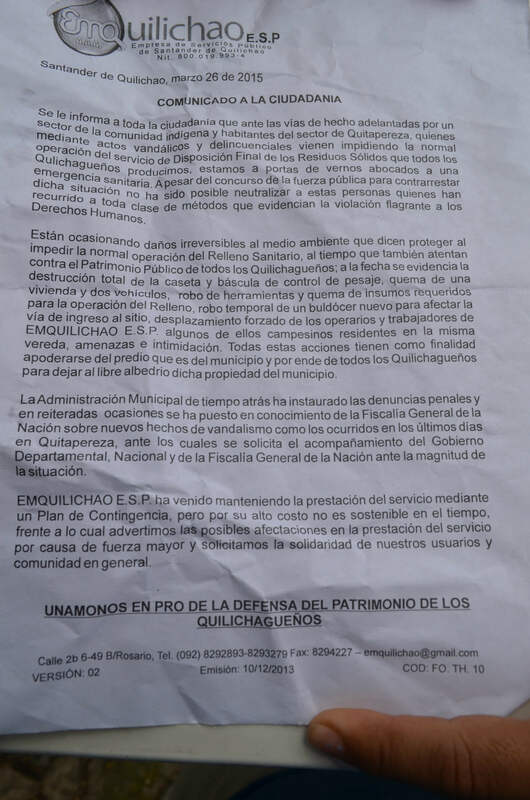 The paramilitaries ordered a regional curfew of 10pm. Threatening prominent Nasa, they signed off with: “United for a northern Cauca without Indians”. This week, the Government issued eviction orders for some of the settlements the Nasa have been establishing in the contested fields around Corinto. From the Monday until Wednesday the same property also seen a Nasa Assembly develop a “plan of life” for the communal ‘recuperation’ of the land. Around the assembly the former sugar-plantation was already growing with indigenous maize, such as the planters had been sowing at La Emperatriz.